Just so you know, this is only a part of the apples required for the recipe. 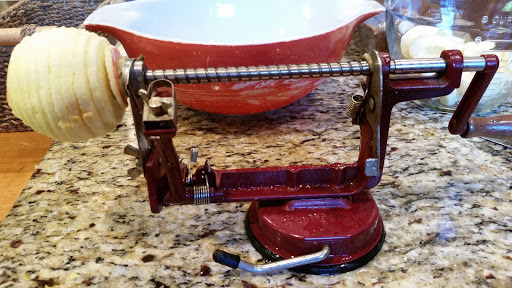 Begin by washing, peeling, coring and slicing the apples. This can be laborious and time consuming unless you have one of these handy dandy tools. It’s an all in one tool that peels, cores, and slices an apple in just a few seconds. It’s the best $20 I’ve ever spent. It took about 20 minutes to prepare 10 pounds of apples. 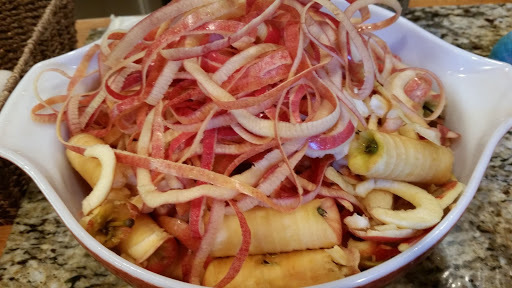 The cores and peels can be used to make juice for jelly, or you can make Apple Cider Vinegar, or you can feed it to the pigs…they love them! Isn’t it beautiful! I slice it in half for this recipe. 10 pounds of apples seems like a lot of apples! In a large stockpot, bring one gallon of water to a boil. Add about 1/3 of the slices, return to a boil, and cook for one minute. 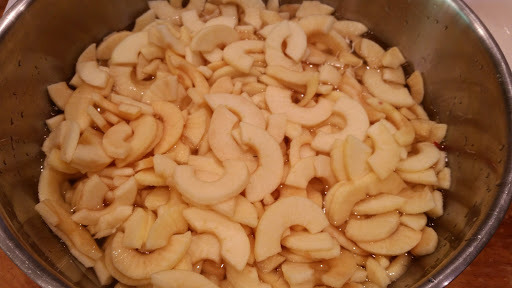 Strain, place the apples in a large bowl and cover while you cook the remaining apples. 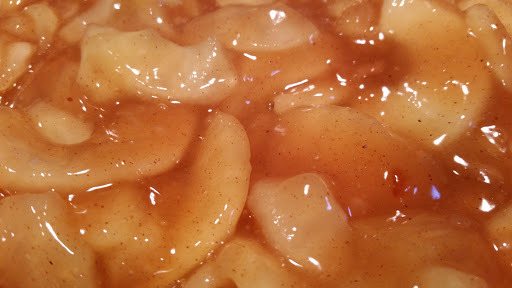 In another large pot, add the sugar, Clear Jel, cinnamon, nutmeg, water, and apple juice. Mix thoroughly and bring to a boil. This mixture will thicken as it heats up. When it begins to bubble well, remove from heat and add the lemon juice. 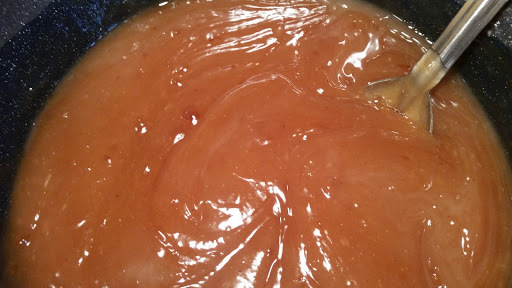 It will look like a soft caramel. Add the apple slices and fold in carefully. 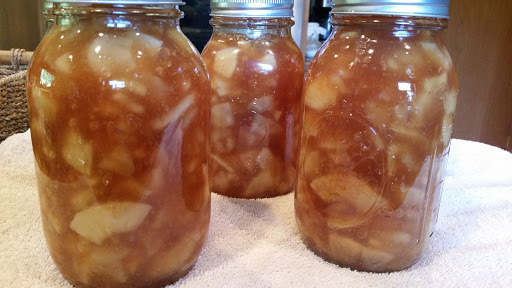 Ladle into sterilized quart jars, remove air bubbles, wipe rims, place on a 2 piece lid, and water bath for 25 minutes. Allow the jars to remain in the water for 5 minutes before removing. Remove from the water bath and place on a towel. Allow the jars to sit for 24 hours before labeling and placing in storage. The number of jars you get will vary. This batch yielded 5 quarts.